Size: 5.8" x 3.5" x 1.25"
In 1974 Canon introduced with the Palmtronic LD-80 their first pocket calculator with the green VF-Display (Vacuum Fluorescent) and stopped the wonderful LE-series started with the famous LE-10. We remember all the calculators using the red LED-Displays: LE-80, LE-80M, LE-80R, LE-81, LE-82 and LE-100 before the LE-83, LE-84 and LE-85 settled the design line. Both manufacturing costs and operating time outdated this technology and we got the new LD-series. The LD-80 used with the TMS0855 a calculator brain similar to the one found in the rare TI-150. With the basic four functions, a [%] key and the optional sqr-function it found its way into most other calculators of the Palmtronic LD series. 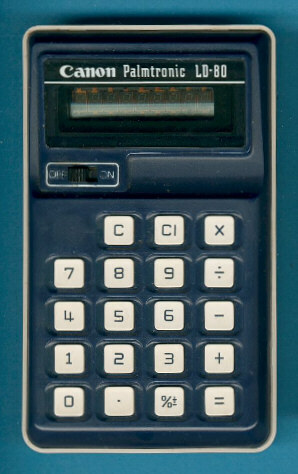 The LD-80 used an unique design and looks more or less like some Sharp calculators. The later LD-81 defined with its blue, yellow and black keys the appearance of the „Palmtronic“ calculators and this style was kept even with some calculators using the LC-Display (Liquid Crystal) like the LC-8M. Shortly after the introduction of the LD-80 a more or less identical calculator called Panther D appeared on the market. Don't miss the Palmtronic 8 mini introduced about 1975. © Joerg Woerner, January 19, 2003. No reprints without written permission.